preventing urban sprawl by limiting the expansion of urban areas based on strict criteria. The plan also puts a particular focus on climate change, and how land use rules can help us to limit and reduce emissions, and prepare ourselves for the effects of a changing climate. an executive summary that’s helpfully quite a bit shorter than 180 pages, and a good overview. Fortunately, the provincial government seems open to the recommendations and their goals. The next thing we need is specific plans to put this great vision into practice. The second stage of the review is expected in early 2016, along with another round of consultations with communities. We know our communities in Waterloo Region will be eager to support this vision and its implementation. Stay tuned, and we’ll look forward to updating you on the next round of consultations once they’ve been announced. This entry was posted in Uncategorized on December 9, 2015 by Kate Daley. Last week, Bill 73 became law in Ontario. The Smart Growth for Our Communities Act has made important changes to help communities like ours grow up instead of out. Bill 73 was the result of a review conducted by the province over the last few years of its land use planning and appeal and development charge systems, which involved significant community consultation. Other aspects of the bill include changes to allow municipalities to collect development charges that more closely reflect the costs of providing services like transit to new developments, and stronger requirements for municipalities to account for how they spend development charges and consult with their communities on major planning documents. We’re very encouraged by many of these changes that resulted from the government review, which will help communities like ours to build stronger neighbourhoods and protect valuable farmland and sensitive natural areas from urban sprawl. Currently, the provincial government is conducting another review, this time of four major plans that govern land use in the Greater Golden Horseshoe, and a review of the OMB itself has been promised after the current review concludes. We look forward to these more recent reviews, and to more positive changes like Bill 73 being proposed and made by the government in the months to come. A broad coalition of environmental groups recently recommended the protection of a large “Bluebelt,” which would add 1.5 million acres of land that are crucial for water protection to the Ontario Greenbelt. A proposed “Bluebelt” that would expand Ontario’s Greenbelt to protect our water. 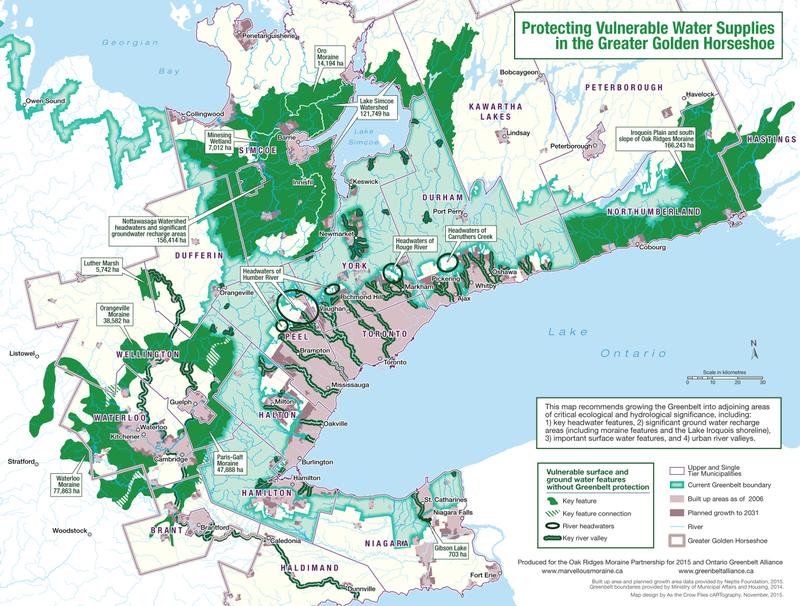 Map via the Ontario Greenbelt Alliance, November 2015. The Province of Ontario is currently undertaking a coordinated review of provincial land use planning policies. This review focuses on the Growth Plan for the Greater Golden Horseshoe and the Greenbelt. The Province particularly asked for input on where the Greenbelt should be expanded. We expect the release of recommendations from the Advisory Panel, chaired by former Toronto Mayor David Crombie, in the next several weeks. Here in Waterloo Region, we’ve been talking about our growing water needs for decades. We’re lucky to have and rely on high quality groundwater for the most of our water supply to support our growing region. We know that water is a precious resource in our part of the province, and that human activities can threaten our aquifers. Community members and the Region of Waterloo have been working hard to protect our groundwater with a broad range of local programs affecting everything from use of road salt to the land use planning for the entire region. Because of our local protections, expanding the Greenbelt to cover our Protected Countryside wouldn’t change things on the ground for landowners. But it would add an extra layer of crucial protection for our most important resources, and would ensure that our local resources are part of a network of protection that would extend beyond the boundaries of Waterloo Region. The Region of Waterloo asked to be included in the original Greenbelt at various stages of the process, but the Province did not include our sensitive moraines in the Greenbelt at that time (see page 226). This is the opportunity to correct that omission. We look forward to release of the recommendations from the Advisory Panel, and to the next round of consultations where members of our community will be able to tell the Province that now is the time to fully include our community’s vital resources into provincial plans. This entry was posted in Uncategorized on November 16, 2015 by Kate Daley. The first phase of consultations for the provincial government’s Co-ordinated Land Use Planning Review has concluded. Like people from communities across Ontario, we’re eager to see what changes the Province will propose before the second, more specific round of consultations is launched. In the mean time, some of you may be interested in Smart Growth Waterloo Region’s short submission to the first phase of the review. We’ll keep you posted on the review. Given the huge interest expressed in our community during the first consultation round, we know you’ll want to be in the loop. This entry was posted in Uncategorized on June 8, 2015 by Kate Daley.